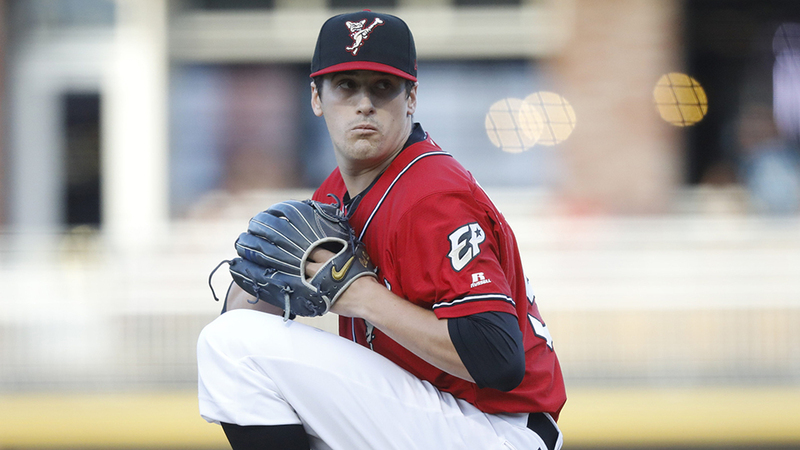 El Paso lived to see another day, thanks to Cal Quantrill's best outing since he was promoted to the Triple-A club. The 10th-ranked Padres prospect pitched shutout ball into the seventh inning as the Chihuahuas blanked Fresno, 2-0, on Friday at Chukchansi Park to avoid a sweep on the best-of-5 Pacific Coast League semifinal series. He gave up two hits and a walk while striking out seven. The 2016 first-round pick said he didn't feel the weight of trying to keep his team alive. "Honestly, maybe there's less pressure," he said. "There's nothing to lose, right? So you kind of just go out and do your thing." The son of former big leaguer Paul Quantrill was 3-1 with a 3.48 ERA in six starts since his Aug. 5 promotion from Double-A San Antonio and completed six innings in half of his appearances. "I think a big part was I went back to how I did it at college," he said of his Triple-A success. "The season wasn't going the way I thought, so I just reverted back to some old ways, and some of it is just things started clicking." The Stanford threw 56 of 88 pitches for strikes and held the potent Grizzlies hitless after the second. He faced one batter in the seventh, with AJ Reed reaching on an error by second baseman Carlos Asuaje. Kyle McGrath and T.J. Weir combined to get three outs, Kazuhisa Makita retired the first two batters in the eighth before putting two men aboard and Gerardo Reyes got the final four outs, fanning three, for the save. Astros No. 12 prospect Rogelio Armenteros (0-1) allowed two runs on six hits and two walks over six frames, striking out seven. The Chihuahuas took advantage of Armenteros early. Forrestt Allday and Asuaje opened the game with singles and Ty France walked to load the bases. After Shane Peterson struck out, big league veteran Allen Craig doubled home Allday and Asuaje. Armenteros fanned Brett Nicholas and Raffy Lopez to minimize the damage. Although Quantrill reached the penultimate goal this season, he's not ready to look toward 2019 and a possible Major League debut. "Nope, we got something to worry about right now," he said. "We got hopefully, seven, eight, nine more games. That's what I'm focused on. When 2019 comes, I'll worry about 2019." Game 4 is Saturday in Fresno. El Paso was a PCL-best 45-24 away from home.